You probably don’t associate professional upholstery cleaning services with cleaning car upholstery but many local carpet cleaning companies in Fort Wayne provide the service. Most of us drink coffee or soda in our car when driving or grab a quick bite to eat from the drive-thru at a fast food restaurant. It is almost inevitable that at some point in time you will spill your drink or your food onto your car seat and cause a stain. It is even hard to keep your car upholstery clean if you often have children riding in the car with you. There is a good chance your children in the backseat might spill their milk or snack onto the car upholstery. Or worse, your children might use the car seat as an art canvas and draw on it with crayons or markers. The principles of upholstery cleaning are the same for a car seat as a couch, sofa or recliner. Fort Wayne steam cleaners will use their steam cleaning process for carpet and upholstery on your car interior. This means spraying a lot of soap and water into the car seat and then attempting to extract as much of the soap, dirt and water as possible. You might imagine that this often leads to very wet car seats for a few hours or even over night. If you need to drive your car shortly after the service you probably should avoid steam cleaning car upholstery and consider another option. 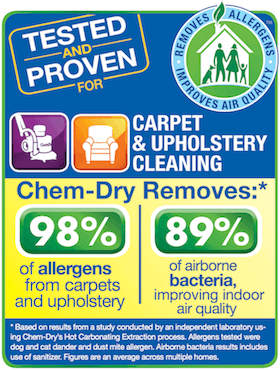 Chem-Dry of Fort Wayne offers upholstery cleaning for cars that doesn’t use as much water as steam cleaning. Our service requires 80% less water for upholstery cleaning for cars and furniture in your home. Learn more here. The process will remove food and liquid stains from car seats. We even have special techniques to remove ink, marker and crayon from upholstery too! The service is fast and your car seats will be dry in only 1-2 hours after we are done so you can get back on the road right away! To schedule our service for cleaning car upholstery, call (260) 409-1138 today!